This entry was posted in Beer Industry, Jolly Good Beer and tagged attenuation, cooling, distribution, keg, KeyKeg, pressure, PSI, Yeast by Yvan Seth. Bookmark the permalink. Why don’t kegs have a pressure relief valve built in? Probably cost. Especially on the plastic throw-away ones. They probably should. I’m pretty sure some in the US do. Part of learning to be a cellarman for cask is learning about venting and tapping the beer, the same must be done for keg. But too many places assume craft keg (by which I mean unfiltered/unpasteurized) can be treated the same as mass-produced keg. Education and training need to be brought in. Even a single page handy guide would help start the process. I’m still not certain what I think reasonable expectations are. Is venting CO2 from keg something we ought to expect pubs to have to do? If breweries don’t get it too wrong and distribution & pub store cold (or store only briefly) then the problem should go away? I wonder if it is at all common in the US? 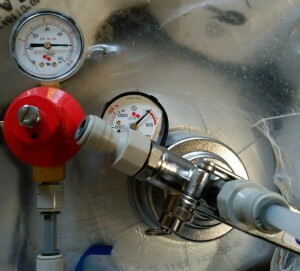 So – how do you vent a keg/keykeg down to an acceptable level? I’m planning something on this topic. You can vent both types of kegs via the coupler, releasing CO2 just as you do when you vent a cask. It’s a little trickier than just bashing in a peg alas. So I’ve shot a bit of video footage, but I’m not happy with it and need to try that again. I also need to do a post with suitable pressure charts, etc. I thought of this post this evening as I watched a barman effortlessly filling an oversized half-pint stem glass with foam. Poor guy, it took him a good three goes to get a glass of beer out of the tap – the wastage rate on that beer must be horrific. (And it was that beer – I had a half from another keg tap which poured as calm as you like.) It does sound as if ‘live’ beer in a keg needs to be handled pretty similarly to ‘live’ beer in a cask, i.e. with care. The yeast is not mocked!